Update 5-3-16: Very Important Article on how the Big TV Networks use warped polls as weapons against the American people . . . Read article here . . .
Update 4-30-16: While it appears the Old Guard may be giving up on stopping Trump from getting the GOP nomination, Trump is still vulnerable to computer rigging in the upcoming Indiana primary. Again, Mr. Trump needs to raise the issue of easily-rigged computer elections counted on secret programs that not even the election officials are allowed to see. This issue will become MORE RELEVANT if Trump gets the GOP nomination and is running against Crooked Hillary Clinton. Update 4-26-16: The Old Guard Ruling Elite has given up on trying to stop Trump in the GOP with Cruz & Kasich, two duds who, in both cases it turns out, have personalities which wear negatively on people. The Trump crowds of 10,000 to 35,000 have kept up for ten months. Trump has correctly stated loudly for weeks that the delegate process is rigged against outsiders like him. If Cruz or Kasich or Ryan ascend the stage to accept the Republican nomination in late July, most Americans will be guffawing – and will be sure that that the whole system is rigged. So the Old Guard is in a box. Trump has done himself a world of good by screaming that the delegate system is designed to be rigged by party insiders (True!). Looks like Old Guard is afraid to mess with delegate system now because whole world is watching. SAME GOES FOR SCREAMING ABOUT SECRET VOTE COUNTS !!! Once the issue is raised, the Old Guard almost has to let the real votes prevail, which means Trump is elected President over felony-laden, robotic, evil, shallow demagogue Hillary. More on this soon. Update 4-21-16: Super Crook Reince Priebus, national GOP Chairman, says GOP Elite is considering electronic “voting” to “count” the rules-change issues at GOP convention in Cleveland on opening day. Electronic voting = easy-to-rig, hard-to-verify. CROOKS! Update 3-22-16: Utah Caucus Today: 15 Year Old Soros Plan for Riggable Internet “Voting” Being Rolled Out . . . Read More . . .
Update, 3-21-16: Let’s See the Ballots, Ohio. (Trump vs. Kasich) Check out video immediately below, and . . . Read Short Article . . .
Update, 3-16-16: Kasich absurdly Computer-VoteFrauded to “win” in Ohio. Check back for audio analysis soon. Update, 3-14-16: To Computer-Votefraud Trump, or not to Computer-Votefraud Trump in Ohio? . . . Read more . . . This would set the nation on fire in favor of Trump, and Trump bringing the votescam issue up would make it very difficult for the Old Guard to cheat Trump at the computers. If Trump lost Ohio, even if he really lost, — half the world would think that Trump had been computer-votefrauded. And the Old Guard doesn’t want to risk the nation laughing at computerized elections. But most people are still unaware of how our nation is being stolen via computerized votefraud. Here are several articles that are finally hitting directly at the real issue in today’s election: VENDOR FRAUD — the Vendors hired by 3137 or our 3142 counties in all 50 states. The Vendor’s have the MOTIVE, MEANS, and OPPORTUNITY, while the county and state election officials TOTALLY abdicate their duties, and step aside completely. (96% of the USA vote is counted by three mega-vendors, ES &S, Hart, Dominion; Dominion recently bought Diebold and Sequoia.) While the below articles are long, they finally hit the right message about the dangers of computerized votefraud. ScannedRetina.com details the exact solution — the message that has been on this OpenLetterToDonaldTrump.com for six months or so. Thanks to everybody who is spreading the message for a return to TRANSPARENT, HONEST ELECTIONS. And — somebody — make sure Mr. Trump sees this. If he doesn’t object to the secret computerized vote “counts” in public, he will be cheated out of the nomination and/or the November election. This is THE MOST IMPORTANT ISSUE, and only issue at this time. SUPER TUESDAY ANALYSIS: US citizens will again be presented with published election results that must be accepted as an ACT OF BLIND FAITH . . . (Read More) . . .
Quick Analysis of Trump Victory in South Carolina: Does the “Old Guard” Coalition calculate that they can’t take Trump down believably so they are allowing some margin of victory? Please, Everybody!, don’t take your eye off the ball. If those controlling . . . Read More! . . .
Feb 9, 2016 Update: Donald Trump must challenge the easily-rigged, secret computerized election counts and demand paper ballots counted in the open, before the ballots leave the public sight, at each of the 200,000 polling places in the USA. There are no paper ballots at all in South Carolina and other states!!! Feb 6, 2016 Update: Rubio Fake Surge! Why Trump Must Speak Out Now against Votescam! We proved the Iowa GOP ANNOUNCED THE WRONG WINNER of the 2012 Iowa Caucus, which forced them to change the winner! judges who interpret this Living Document constantly and they usually have different opinions as to it’s meaning. RALPH an 86year old KOREAN WAR vet & proud of it!! You need to ask why we need to bring all these refugees in and pay them when we have so many homeless now in our country. We need to take care of our own people. Keep hitting her hard, she will bring our country down never to rise again. WE NEED YOU DON’T LET OBAMA’S HAND EXTENTION (HILLARY CLINTON) WIN. SHE WILL DESTROY WHAT’S LEFT OF OUR GREAT COUNTRY. I’d love to see you choose Condaleesa Rice for VP she has the experience and without any negative use of her office like Hillary Clinton does. If Clinton gets the office, we will have 8 more years of Bill in there. You must beat her. and save us from all the lies. and Obama’s agenda. CONGRATULATIONS!!! WE ARE SO HAPPY FOR YOU AND LOOK FORWARD TO AMERICA BEING PUT BACK ON THE TRACK OUR FORE FATHERS MEANT FOR US TO BE ON! WE LOVE YOU!! Thanks, Joyce. You keep up the good fight, too. Tell all your contacts nationwide to read the open letter to Donald Trump on the home page, and to especially read the menu tab “Election Nite Gatekeepers” at OpenLetterToDonaldTrump.com — thanks. Jim Condit Jr.
What the heck are you doing.! Your a businessman trying to be a politician and being dragged down to a politicians level. Be a businessman and don’t make broad based agreements with the nation according to other politicians promises, your advantage is lost taking this path. You have an obligation as a businessman to bring to the the best of moral theoretical and environmental CONSULTANTS to rebuke the media trying to convict you and you haven”t. Women and minorities are VICTIMS and deserving of all the LEGAL opportunities as American citizens allowed BY LAW. Get off the wagon of he said she said histrionics of grade school and head into your billionaire status of success for leading business to success and are willing to apply that effort to success of the great country our forefathers have striven to achieve into a new level of greatness it deserves………or your fired! This website is not run by Trump, not has any connection to him except being an open letter to him. 9 Billion Dollar initial order! NUFF SAID?? State or Province : N.H.
No “ifs,” “ands,” or “buts”…you MUST, MUST, MUST find some way to UPDATE your site MUCH, MUCH more often! WHY, for example, have you STILL NOT added a video on the vote fraud in the OHIO Republican primary? Today is the 18th! You also need to be quicker in posting video updates to your You Tube channel. If you want more traffic to your Internet sites/channels, then you MUST become more EFFICIENT. Sites that update quickly get MORE TRAFFIC! Sites that take days and days to add content that should be up right away after major events break…well, those sites LOSE traffic. Welcome to the 21st Century! Agreed. Donations at LetFreedomRing2016,com would help, But we’ll do our best. serge from montreal Quebec !!! im in realestate and hope donald will be the next president !!! now naturally this message will never get to the donald but im just taking a chance it could get to him,,, !!! we have a realestate company here in canada ! Mr. Trump. I was not going to vote for you until I heard the Ohio Rally. Then something clicked. I pray for your safety and a landslide WIN! Cat McCormick — Esquire magazine (thinly veiled) and a New York Times blogger, Douthat, (openly) have called for Trump’s assassination. The Glen Beck report — that Beck wanted to stab Trump over and over again, was false; Beck was speaking to his producer, which was obvious on Blaze TV, but not obvious on the radio. The Secret Service did visit Glenn Beck within two hours after the radio show due to this audio ambiguity. The Ruling Elite is in a box thanks to the internet, Twitter, Facebook, and those super huge crowds Trump is getting. 20,000 in Dayton, Ohio today, 28,000 in Cleveland. Mr. Trump. I was not going to vote for you until I heard the Ohio Rally. Then something clicked. You’re the only one that can save our great country from impending doom. I pray for your safety and a WIN! Hello, I’ve tried to watch your 3-8-16 video, but can’t access it. It states that the video has been removed by user. Please help with how it can watch it. Thanks. Dear Trump: You have an Enemy within your party, it’s called the Establishment. Lincoln said if America ever fell in would be from within. The party Lincoln started has now become that Enemy. He saved the Union, his party has become the destroyer. The Republican Party has never been Conservative, even under Reagan. Party is run by Neoconservatives, i. e. Neocons, they are not Conservative. Neocons advocate Hegemony for America, which means Leadership or Influence, by one Country or Social groups over another. In other words America rule over all other countries of world, One World Gov. They’ve been ruling Republican Party since Reagan. They want Rubio or Kasich, not Trump or Cruz. So the Dictator Stalin’s quote is true for America, the people have never picked or voted for a president of their choice. Now we have one & outsider, so all means by the Establishment will be used to destroy Trump, & same for Cruz, because he is a conservative. The Republican Party Establishment who hate Conservatives with a passion, are now claiming to be Conservative, so they can win again with Rubio or Kasich whom they control. So true, Paul. Only thing is, I think Cruz is a fake also. Heidi Cruz, his wife, wrote a big book with CFR members advocating North American Union, a step to world government. Look for book on Amazon. Cruz is a Trojan Horse and not Constitutionally eligible to the office of President. He Kasich is a Globalist (believes in Common Core, TPP, NAFTA, Obamacare and amnesty, to name just a few of his Progressive positions). Ohio’s primary last night was a farce. What I especially liked about the run up to Ohio was Kasich’s ADAMANT vocal affirmation that he WOULD win Ohio. We have known about vote fraud for 20 years…Bev Harris’s BlackBoxVoting is superb. In SD we have tried to return to purely paper ballots for many years, but our bought and paid for legislature won’t even let it come to the floor…naturally! I am Paul and i am providing Internet promotion services from past 5 years. I just checked your website http://openlettertodonaldtrump.com/ and it has potential. I am Jason and i am doing Internet and Search Engine Marketing business from past 8 years. Do you want daily 100-200 extra visitors driven to your website? And also I’ll do link building with other related websites. We’ll also target your website to bring in 1st 10 listing of Google on your targeted keywords. So, monthly you’ll get lot of visitors and this will surely boost your internet business. Let me know if you are interested and we’ll start this campaign for you. If you have any kind of questions, don’t hesitate to ask me. i am told that the democrats that support Donald now, if they do not register to vote and change to vote republican prior to the primary, their votes will not count in the general election. I don’t know how true this is but heard it from Larry Nichols. YOu may have heard of him in the Bill clinton years. He is destined to bring down Hilliary. So did you ever get a “live” response from Mr. Trump, Ivanka, Eric, or Don Jr., per your comments dated Jan. 3-4, 2016? I remember when Ron Paul refused to “stand up” & renounce/fight the Election Fraud when he ran for Prez. What a turn-off that was. The past few days in NH, Trump has been saying, “I don’t want to talk about Iowa. I’m here now. I want to focus on NH.” Which makes sense, of course but if ignored, Iowa voter-counting frauds will be forgotten. When queried further re Iowa fraud, Trump merely says, “Well, they are looking into it.” They who? I was a Republican all of my voting years(44) I do not trust either major political party. Trump is our only chance. Thank you for what you do! God bless America! Great analysis. I participated in the 2008 election in Florida as a poll worker. The system was wide open to fraud. They are rigging the votes against Trump they want Rubio. So true, Sharon! If you wish, — please go to WatchTheVote2016.com and sign up for the email alerts so we can keep in touch with everyone who understands this issue. I think the same happens if you check “Subscribe to updates when you leave a comment on this website, I think. i am told that the democrats that support Donald, if they do not register to vote and change to vote republican prior to the primary, their votes will not count in the general election. I dont know how true this is but heard it from Larry Nichols. YOu may have heard of him in the Bill clinton years. He is destined to bring down Hilliary. Thanks, Everybody, for your support! Let’s spread the word before New Hampshire, South Carolina and Super Tuesday! This is outrageous! If the American people only knew. Shocking! A lot of people don’t vote because they say our vote wont matter. At this point it appears to be true. Enough is enough. We have to change this asap even if we have to vote with the purple finger. As average American citizens, what can we do to help make this change. Signing online petitions are useless, complaining isn’t doing a damn thing.. If we have to march, so be it. What can we do. I am from Las Vegas and our caucuses are soon. I’ve never been to a caucus, I hate the whole idea, but I plan on going to this one. I am ready to make some noise, just need to know what kind of noise and how loud to make it. Please give us a report from the Nevada Caucus. Here is the answer to changing things: Sign up at NetworkAmerica.org by your county and state. That is our website designed to organize people into the precinct system — to run for precinct, win, and then go to the county meeting and replace the heads of the Democratic and Republican parties. It’s the board of elections at the county level that can change the way the votes are counted in that county. In the 1930’s my grandmother was promised $5.00 if she voted for Roosevelt. Think she couldn’t use the $5.00? You bet she could and she did what they wanted. Think that kind of promise isn’t going on today? Think again. Thank God finally someone speaking out against voter fraud!!! Fran Lee, thanks for your understanding of the danger. A suggestion: please use election fraud instead of voter fraud. VoteR fraud, where an individual voter tries to vote more than once, is a problem that should be corrected. But 1000 times the problem is Election Fraud — the fraud committed by the Vendor who has been hired on election night by your county or my county. These Vendors controls the program, will not let anyone, including the Election Officials who hired the vendor, look at the source code of the software. 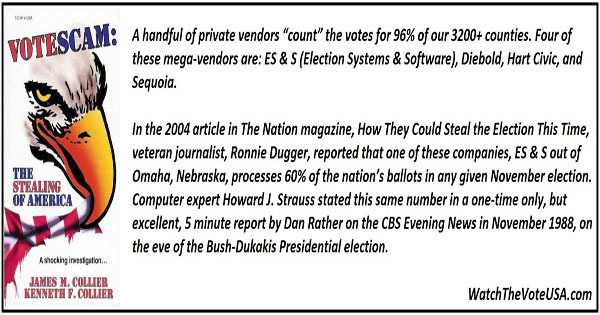 It is Election Fraud, committed by the Vendors who run the software on election night, that is the real problem. The local Election officials’ sin is stepping aside and totally abdicating their responsibility to run transparent, verifiable elections. We need to put the traitors in Congress on trial. Sheeple have no clue how corrupt WDC is and how controlled things are that “they” can put anyone they want into the presidency. Big Finance controls Big Business; Big Business controls Big Government; Big Government controls We the Sheeple…who have no interest “to form a more perfect union…”. So if you don’t want to pay income taxes anymore, then help elect me to Congress. I’m the last man in America with guts. Follow me on FB and Twitter (@TexasGovernor1) and find out how we can put the traitors in Congress on trial. Spread the word to make my campaign go viral. Help me return Congress to citizen representation. Elect me to lead the effort to put Congress on trial. “See what has been found in the Canada Law of Citizenship Act 1946–47=they had no dual citizenship until the new Citizeship Act of 1977==when they adopted the dual citizenship==keep in mind Cruz was born in 1970 therefore he falls under the Citizenship of 1947==now in 1968 cruz father applied for and was granted Canadian citizenship and one yr. later his wife (cruz mother ) became a Canadian by rights of Canadian Law and the US law removes her US citizenship ==So he was born …a natural born citizen of Canada at birth ==therefore he was not then nor can he ever be a natural born citizen of the US ==in 2014 crus renounced his Canadian citizenship but then to be a citizen of the US he must file and be accepted BUT no documents can be found that he ever did that under the Freedom Act of the US ==he received a letter from a Brbara Ketay co-founder of the National American Law Center on 12-18-2013==that he is not now nor can he ever be a natural born citizen of the US( as required by the US Constitution )and should with draw from the presidential race / VP ==he did not reply to her letter==he has served in the US senate seat as a Canadian ==committing a Fraud==see documents ==google==Captains Quarters -Ted Cruz Citizenship Timeline =documented scribd == read many letters at bottom of the gov. timeline== or find it on FB where it has been shared many times ===” Thanks for the research Joyce Herder ! Thanks, NilNutt, for the only perfectly clear explanation of this subject I have so far seen in writing. Why no big media outlet will carry this explanation in depth, and then agree or try to refute it — is suspicious, to say the least. I’ve been a business / IT analyst for over 30 years. In 2 minutes I’ve conceived a design for insuring 100% accuracy of every vote at a very minimal cost. Each voter would be able to visibly validate their vote counts with complete secrecy and further tallying of them up to the final count. Actually it’s quite simple. A suggestion for a back door to Trump is if there are any veterans out there wanting to help. Trump might listen to a veteran’s concerns. Thank you. Wonderful work. I am looking forward to reading the book “VoteScam”. This needs to be an open letter to Ted Cruz, and Rand Paul also. Thank you. Yes, Davy, you are right. We are about to approach the Trump, Cruz, Paul, and Carson campaigns. The establishment obviously wants Bush, Christie, Kasich, or Rubio. We are for a fair count for EVERYBODY, but we can see who the Old Guard are pushing, and who they want to destroy via votefraud. The only way we will get a Bush, Christie, Kasich, Rubio, or Hillary is by manipuation in Iowa and computerized votefraud thereafter. Looked up Voter Fraud on Safari and found a link by DC CLOTHESLINE re voter fraud., originated by Dr EOWYH , FELLOWSHIP OF THE. MINDS. In essence, 30 years ago RNC was taken to court by the DNC. 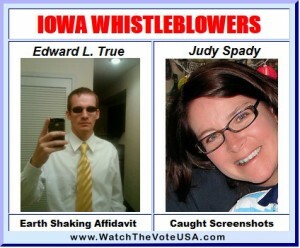 For violating the VOTER RIGHTS ACT. Judge . Dickerson R Debevoice presided. Ruling was that RNC could no longer investigate or pursue voter fraud or over see election stations. At the age of 87 , the judge returns to renew his ruling. In 2010 the RNC tried to appeal the decision , but. It was thrown out by Judge Joseph Greenaway Jr. US Court of Appeals 3rd Circuit. My fear , next election, that the voting booths will be flooded once again with voters bought and paid for with cash or promises and enlisted from the hoards of illegal aliens or refugees who are coming into the country. This time on a more massive scale because Obama has a legacy to protect. The real problem is the Iowa GOP switching the results on the night of the caucus, and computer votefraud done by Diebold and the other vendors running the computer programs for the counties on election night. The things you mentioned are also problems, of course, and must be combated. This is awesome! Well done! If Trump doesn’t follow the advice in this letter, and speak up about vote fraud and securing honest counts, he’s either an idiot or on the take. I pray he does the right thing. Awesome. Finally, someone is addressing the elephant in the room! Thank you for shining light on the criminals who have been selling us out and warping our destiny. Bravo! Trump will you do something like the above iowa’s poll were no doubt tinkered with……. 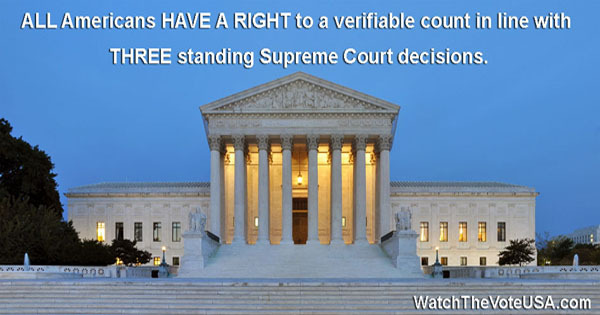 Please up the anti and use the 3 Supreme Court cases to back up your plan…. We are counting on you!!!! Ty… We need Trump! Help him if you can.